More than 80% of any data in any organisation is unstructured. And now, Big Data is all the rage. Everybody is being led down the path of the great strategic value of collecting huge amounts of data. Everyone talks about the wonderful business advantages of capturing and understanding Big Data. But note this – no one is saying exactly how to turn all that unstructured Big Data into actionable analytics. You will often hear you need to get a “data scientist”. Or that you should write thousands of lines of custom code in Map Reduce. Often, they ignore the subject altogether. Why? Because data scientists and thousands of lines of custom code in Map Reduce are simply not the answer. At BIReady, we have the one and only solution for turning unstructured data into real, usable and accessible information. Bill Inmon, the Father of Data Warehousing, is leading the way with a technology called “textual disambiguation”. With textual disambiguation you can make sense of your unstructured data. Bill’s product, Textual ETL, will give you a decided advantage by using Textual Disambiguation to process the unstructured textual data in your organisation and turning it into a format anyone can access and understand using any BI tool. Textual ETL is the technology that allows an organisation to read unstructured data and text in any format and in any language and to convert the text to a standard relational data base (DB2, Oracle, Teradata, SQL Server et al) where the text is in a useful meaningful format. Textual ETL creates a textual data base in a relational format that is fit for analytical processing. The applications for this cutting edge technology are truly endless. Here are just a few that we have identified: • Accident Prevention • Call centres • Contracts • Email analysis • Health care • Litigation support • Loan portfolio analysis • Pre-emptive litigation preparation • Social Media sentiment analysis • Warranty Claims Protected by nine patents and based on the research and design of Bill Inmon of Forest Rim Technology, Textual ETL includes the ability to: • Read any source of text – email, Hadoop, .doc. data base, etc. • Handle text in any common language (English, Spanish, French, German, et al) • Interpret both “standard” text (the language your English teacher taught you) and shorthand (the notes your doctor makes when you have a checkup) • Transform the text into any standard relational data base management system (Oracle, DB2, Teradata, SQL Server, et al) • Scale up to handle large amounts of data • Address the issues of multiple terminology for the same term • Apply taxonomies and ontologies to raw text • Recognize and manage logical sub divisions of text as it resides in the document • Manage the entire range of repetitive, non repetitive and mildly repetitive documents • Perform both document fracturing and named value processing • Order multiple forms of text – standard text, doctor’s notes, comments, shorthand, tweets, and so forth • Visually display the clustering of words and terms • Back reference a document • Accomplish homographic resolution • Locate and recognize patterns of text And many other features too numerous to mention. Textual ETL reads electronic data from any source. Some of the typical sources include: • Standard Microsoft formats • Email • Html • Facebook • Databases • Hadoop and Big Data, and more. To request a demonstration, call us today. 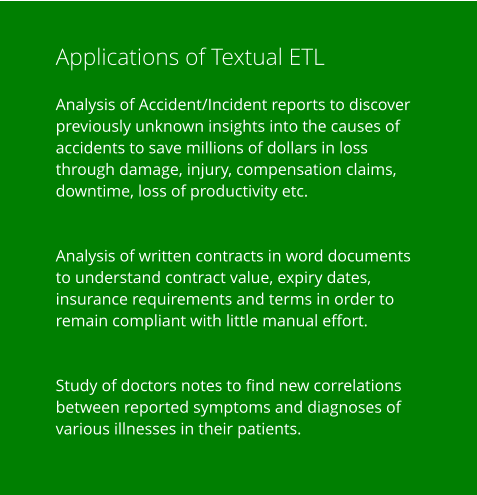 Applications of Textual ETL Analysis of Accident/Incident reports to discover previously unknown insights into the causes of accidents to save millions of dollars in loss through damage, injury, compensation claims, downtime, loss of productivity etc. Analysis of written contracts in Word or PDF documents to understand contract value, expiry dates, insurance requirements and terms in order to remain compliant with little manual effort. Study of doctors notes to find new correlations between reported symptoms and diagnoses of various illnesses in their patients. And Makes that Information Accessible Using Any BI Tool. 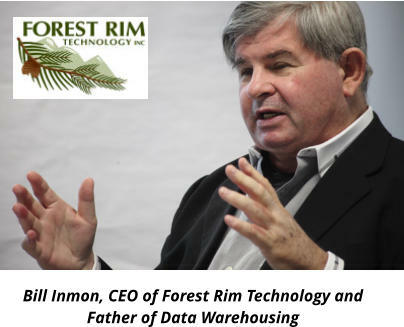 Textual ETL from Forest Rim Technology Today, Big Data is all the rage. Everybody is being sold on the great strategic value of collecting huge amounts of data. And everybody talks about the wonderful business advantages that harnessing Big Data will bring. 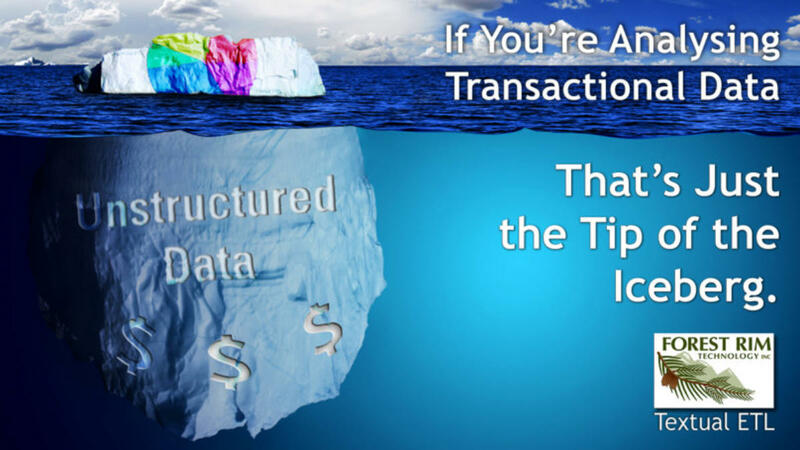 But notice this – no one tells you exactly how to turn all that unstructured data that comes with Big Data into actionable analytics. Sometimes they say you need to get a “data scientist”. Or that you can write thousands of lines of custom code in Map Reduce. Usually they ignore the subject altogether. Why? Because data scientists and thousands of lines of custom code in Map Reduce are simply not the answer. We know how to turn all that unstructured data into actionable analytics. Bill Inmon, the Father of Data Warehousing, who is leading the way with a technology called “textual disambiguation”. 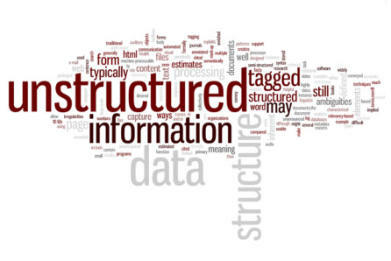 With textual disambiguation you can start to make sense of your unstructured data. Textual ETL will give you a decided edge over your competitors by accessing the unstructured textual data in your entire organisation quickly and easily. This technology is available today for improving your bottom line, learning more about your customers and employees, and for more efficient decision-making. Textual ETL is the technology that allows an organisation to read unstructured data and text in any format and in any language and to convert the text to a standard relational data base (DB2, Oracle, Teradata, SQL Server et al) where the text is in a useful meaningful format. Textual ETL does not put text into a blob. Once text is placed in a blob it is essentially not useful. Instead Textual ETL creates a textual data base in a relational format that is fit for analytical processing. The applications for this cutting edge technology are truly endless. Here are just a few that we have identified: • Accident Prevention • Call centres • Contracts • Email analysis • Health care • Litigation support • Loan portfolio analysis • Pre-emptive litigation preparation • Social Media sentiment analysis • Warranty Claims Protected by nine patents that have been filed, and based on the research and design of Bill Inmon of Forest Rim Technology, Textual ETL includes the ability to: • Read any source of text – email, Hadoop, .doc. data base, etc. • Handle text in any common language (English, Spanish, French, German, et al) • Interpret both “standard” text (the language your English teacher taught you) and shorthand (the notes your doctor makes when you have a checkup) • Transform the text into any standard relational data base management system (Oracle, DB2, Teradata, SQL Server, et al) • Scale up to handle large amounts of data • Address the issues of multiple terminology for the same term • Apply taxonomies and ontologies to raw text • Recognize and manage logical sub divisions of text as it resides in the document • Manage the entire range of repetitive, non repetitive and mildly repetitive documents • Perform both document fracturing and named value processing • Order multiple forms of text – standard text, doctor’s notes, comments, shorthand, tweets, and so forth • Visually display the clustering of words and terms • Back reference a document • Accomplish homographic resolution • Locate and recognize patterns of text And many other features too numerous to mention. Textual ETL reads electronic data from any source. Some of the typical sources include: • Standard Microsoft formats • Email • Html • Facebook • Databases • Hadoop and Big Data, and more. To request a demonstration, call us today.